We did this trip in 5 days – only because we stayed an extra night at one villa. It could easily be done in 4 days, so I’ll break it down as such. In total, the route is 484 kilometers. According to Google Maps, it’s 10 hours and 40 minutes of driving, but I doubt that is accurate. I’d guess it was more like 14 hours. Although it was sad to say goodbye to Dalat, we were happy to be back on the road with rejuvenated asses. Shortly after leaving Dalat, you come to Trại Mát. If you didn’t have time to take the train to Trai Mat and see the Linh Phuoc pagoda, you could do this now. It’s well worth 45 minutes. 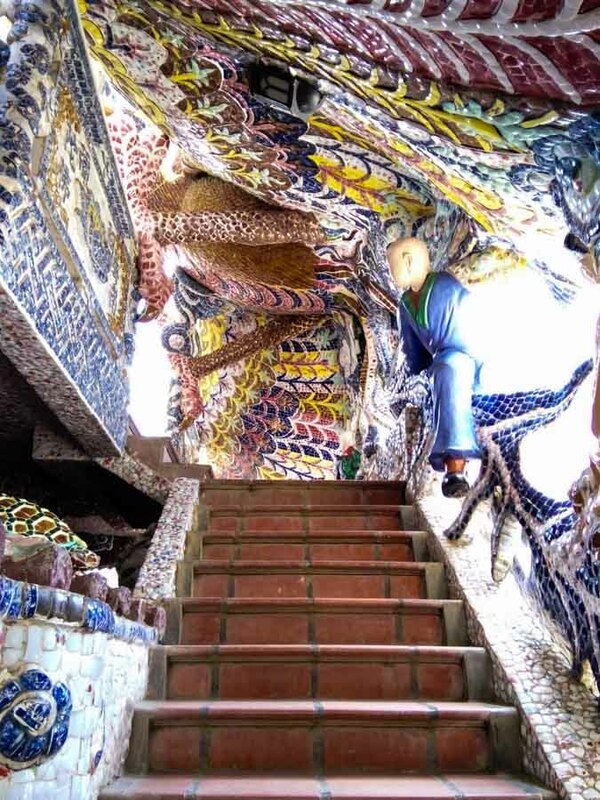 The temple is coated in porcelain from broken dishes. Our first stop was in Cau Dat, about 22 km from Dalat’s city center. We stopped here for one reason: It’s suppose to be the best place in all of Vietnam to grow Arabica coffee. This is due to the altitude, the weather, and the basalt-rich soil. As a coffee lover, I had to try it. We didn’t actually see any cafes on the road through Cau Dat, but just outside of the small village we found a busy little corner-cafe that advertised espresso. The atmosphere was exciting. The price was excellent — only 10,000 VND ($0.45) for a cup of espresso. The coffee was pretty good, but it didn’t blow me away. Driving down the mountain is a lot faster than driving up it. On the way up, our bike struggled in 2nd gear. Coming down, I put it into neutral and coasted all the way to the bottom, only hitting the brakes to take on the extra sharp curves. The Road between Dalat and Phan Rang. Part way down the mountain, after going through D’Ran, you’ll pass under a giant pipeline that shoots down the mountain. This takes water from the Da Nhim water reserve down the mountain. It’s quite impressive to see so close up. Once you get to the bottom of the mountain the drive gets a little boring, but it’s only another hour or so to Phan Rang. We stayed at Hong Duc 2, which is outside of Phan Rang, but close to the beach and reasonably priced. Make sure you get a room at the back for a view of the ocean. The walk-in rates are pretty cheap, so unless you’re traveling on a holiday, there shouldn’t be a need to book ahead. Phan Rang is known for its rice chicken (com ga). You can find a few places in town on Trần Quang Diệu. At night we drove across the bridge to Ninh Chu Bay Beach Club and Bar. They make excellent Mexican food, and fruit-infused vodka. We spent a few hours, sampling the vodka and playing pool. On the way out of Phan Rang, there are many coffee shops around 16 Tháng 4 (April 16th) Park. Otherwise, you can head out of town and get your first taste of the QL1A, the national highway that runs from the northern-most province to the southern. Along the highway, you’ll see many stands selling Phan Rang grape wine. The majority of wine in Vietnam comes from grapes grown in Phan Rang. For some reason, these grapes are usually sent to Dalat to be processed, but there are local wine makers that use them to make a super sugary drink that will likely kill you from diabetes before alcohol poisoning. We detoured off of the highway for a quick stop in Cà Ná, a fishing village. It’s worth a drive through to see all the fish farms. When we went, towards the end of the dry season, many of them were just pits of dirt. When you reach Liên Hương, you can get off the highway and head along the coast. You’ll pass by many Vietnamese resorts – most of these are hard to get to, so western tourists are rarely seen here. I was surprised to see pine trees along some of the beaches. Driving along the South China Sea. If you’re hungry, just before you reach Phan Rí Cửa there are a few restaurants along the beach. After Phan Ri Cua, there won’t be any places to stop for a while, so I suggest resting here for at least a cold drink. The next road is in excellent condition and barely used, despite it being surrounded by beautiful scenery. You’ll fly down hills, past sand dunes, along beautiful blue coastlines until you reach Lotus Lake. We stopped here for lunch. There is a small entrance fee, and the food wasn’t very good, but the views across the lake are stellar. You can also go for jeep, ATV, or ostrich rides here. A Motorcyclist’s dream: fresh highway with an amazing view. From there it’s another 45 minutes to Mui Ne. Originally, we wanted to stay around Suoi Nuoc Beach (just before Mui Ne), but because it was a holiday everything was booked up. We’ve been to Mui Ne a few times before. For information about it, refer to this link: Mui Ne, Vietnam: Resort to It!. This time around, we stayed at Xin Chao Hotel, which has a nice pool and a great restaurant (Indigo Resturant). Knowing we didn’t have too far to drive, we left Mui Ne fairly late (around 10:00). We drove through Phan Thiet even though it would have been quicker to drive around it on the highway. Phan Thiet didn’t impress me at all, but we hardly saw it. Once you get out of it and onto the coastal road, the drive is much better. There are many resorts along here — many of them abandoned or never finished. We ended up stopping at a high-end resort just for a drink. I’m sure the staff appreciated our smelly bike clothes stinking up the joint. For lunch, we stopped at one of the seafood restaurants in Ke Ga. There are a few of them that are on the coast – watch for signs as you probably can’t see them from the main road. The one we found was packed with locals eating seafood and drinking beer. It had a great view of the Ke Ga Lighthouse, which you can take a ferry over to the island to get a closer look at. We decided to just have a meal and some beers before hitting the road again. We didn’t actually stay in La Gi. Instead, we stopped about halfway between Ke Ga and La Gi at Lara Homestay. This place is located on a hill about 100 meters from the ocean. There are shrimp farms and dragon fruit fields surrounding it. It’s peaceful. The beach was a bit dirty, and had a few jellyfish that kept us from swimming, but the rooms are nice and it was just great to get off the tourist trail. A shrimp farm next to Lara Homestay. La Gi beach isn’t far from Lara’s, but we found it to be dirty and unappealing. We ended up leaving it for a resort restaurant where the food was a bit more varied, and the beach was cleaned daily. There’s not much to say about this drive. Once you get on the highway, it’s pretty mundane. There are a few rest stops that you can get okay food in, but some of them are downright awful. Try and pick a busy place, I guess. When we finally pulled up to our house, I felt like I really accomplished something special. I know many people take motorcycle journeys in Vietnam, ones much longer than this one, but I think by taking our time we saw more – even though we covered less ground. Vietnam really is an amazingly beautiful place. This drive cemented that for me. We’ll be sad to leave the country, but at least we can honestly say we feel like we know Vietnam. Even though we are leaving Vietnam, I have lots more information about the country coming up. Please sign up to my newsletter to receive 1 email per week with links to my weekly posts. If you sign up using this link, you’ll receive a free guide to Vietnamese Food with over 75 dishes. This Guide had taken me 2 years to put together, so it’s pretty special.